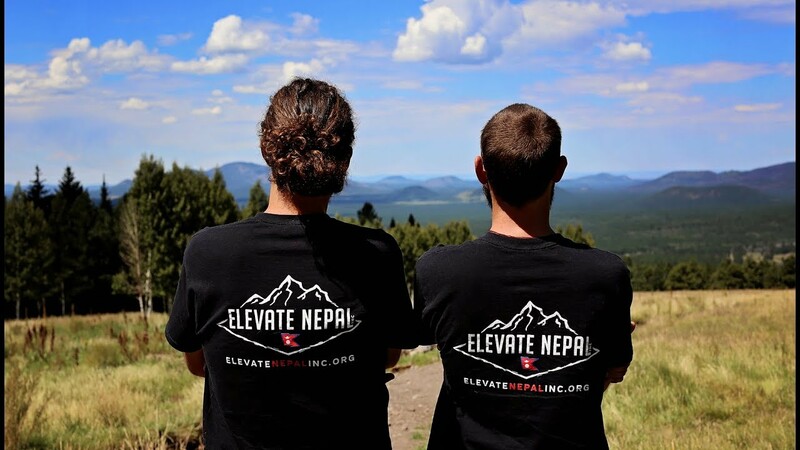 I interview Dan Maurer and Anthony Mancini, the founders of Elevate Nepal five days before they leave to build homes in Nepal. Dan and Anthony have been friends since childhood and now they are embarking on a new venture to rebuild infrastructure after the 2015 earthquake in Nepal. We discussed their story and the challenges they face. SHARON: This season was brought to you by VolunteerPro. VolunteerPro provides online volunteer management training, coaching, and community to leaders and volunteers at all levels. Learn more at volpro.net and stay tuned for later in the show when I will tell you about a special discount for our listeners. DAN: We both grew up in Rochester New York, the town was called Chailai, North Chailai New York, went to the same primary school, middle school, junior high school, high school, but we became good friends in college at Saint Bonaventure University. Yea and have just done a lot of things together, just one of those people you are glad you came across in your life. We’ve been great friends, we’ve traveled the world together, we’ve helped each other out when the other’s in a bad situation. Hey, I got a free couch for you, come on over and we’ll help you out. Now we’ve started Elevate Nepal together, so we’ve started a new venture and we are really excited about. Two guys from Rochester, New York and we are still together here in Flagstaff, Arizona 31 years later. SHARON: Anthony, you have got to add something here. ANTHONY: Together as in we’re friends. DAN: Right, I should… I said we were good friends. Oh yea. We … yea. I think Anthony’s girlfriend is really jealous at times. ANTHONY: Yes, she is. But I don’t know what the word is or else I would use it for what our relationship is? Is it strictly plutonic? Maybe? SHARON: So yea, I thought that was funny in the video you talked about how you had slept on each other’s floors or something. It made it sound like you both needed a floor to sleep on. So I thought, do you take turns being the responsible one that has a floor that the other can sleep on? DAN: Through most of our twenties we traveled quite a bit. I was in Los Angeles, Anthony was in Australia, I was in New Zealand, Anthony was in Arizona, I was in California, he was in Oregon, so we were just all over the place and it was funny how when one person had the job and was making money it seemed the other one was not. So, it always got to the point where you would get that phone call, “Hey I’m coming to town, what do you have?”. Well, there’s your floor space and don’t eat too much. SHARON: So you really are a package deal. ANTHONY: Kismet I believe the word is. DAN: Like I said, together we almost make up one person. SHARON: I asked the guys about if they were concerned about Elevate Nepal testing their friendship. ANTHONY: We kind of discussed multiple times that friendship comes first. If the wires are going to start getting crossed, is it really worth us getting into an argument and ending our friendship over a business venture that we can’t even pay ourselves on? SHARON: These guys clearly have a special friendship, but before we got too carried away we turned the conversation back to Nepal. DAN: First trip was in 2011. It was Anthony who convinced me. I was like you’ve done before, ready to leave my job. I had a very good job. I was working in Los Angeles on TV shows in post-production and was working my way up the ladder and I just needed a break. I wanted to do something and I had been trying to get to South America for years just to have a look around. I called Anthony and said, “Hey I am going to South America” and he says, “Well I am going to Nepal.” And I said, “Why don’t you join me in South America?” and he says, “Why don’t you join me in Nepal?” and we went back and forth for a few weeks and I think I finally said “Sure I guess I will go to Nepal”. I am really glad I ended up doing it because it kind of stemmed into what it is now. I went back solo in 2015 and then we went back together this past May in 2017. SHARON: So Anthony, how did you manage to convince him on Nepal instead of South America? ANTHONY: It was fairly easy, Danny’s pretty impressionable. When he called me up I was just sticking to my guns. I said this is just something I am doing; I am getting it over with so I can stop thinking about it. And then he used this tool called the internet and did a little bit of research and next thing you know he was right there with me. SHARON: So on that very first trip, what surprised you? What was not what you expected based on what you read on the internet? DAN: It is just very overwhelming. Going to a completely different side of the globe and a very different world in many aspects. You know I enjoyed every minute of it but just being that it is so different from home… Nepal is listed 144th of 188 countries on the human development index. It is a very poor country. Up until a few years ago it was listed the 5th poorest country in the world. But just the people, and how they come to life and they are just so hospitable and welcoming. I just kind of fell in love right away. If you sit down in Nepal and stare at the street, every 5 minutes the most spectacular thing is going to come by. As soon as I got there, in the cab ride to the hotel I thought, this is awesome, this is great. When you show up you’re like, this is the same but different. SHARON: So what was just one of those amazing things that goes by if you sit there for long enough. ANTHONY: And then a guy walking down the street with a refrigerator strapped to his head. ANTHONY: The possibilities are endless. SHARON: When did you actually decide that you wanted to help? DAN: We were there three months; we spent 35 days hiking to Mount Everest base camp, which was a great experience. And then Anthony had the idea of volunteering on farms through a program called WWOOF, which I believe stands for Willing Workers on Organic Farms. He did that in Australia and we thought it was a great way to experience the culture but kind of more thought it was a way to stop money from coming out of the wallet, but again, what an amazing experience. And that’s when we really got to experience the culture. We really got to learn how people live over there. I think the day we left Nepal, and I can probably speak for Anthony, was the day we wanted to return. SHARON: Dan explained to me that for four years after visiting Nepal they thought about how to get back. They had ideas for starting an ecotourism business or some other venture that would support the people of Nepal and allow them to go back. But then disaster struck. DAN: So the earthquake hit April 25th of 2015 and then immediately Anthony and I started thinking about how can we help. We started sending some money and things to friends over there who were in a very dire situation and then immediately started a crowd funding campaign to just get things going. We booked our tickets, we were going to go together and we’re like, this is the time we are going to kick off our company, our organization. The night before we were going to leave Anthony came down with a very bad flu and ended up delaying our trip. Thanks a lot. And then he ended up being too ill to go unfortunately, so I ended up going solo. ANTHONY: After I got sick and missed the trip, the tickets ended up going up to about $6,000 each and I had three weeks off of my job at the time and there was no way I could afford to do that. DAN: Was that out of your budget? $6,000? ANTHONY: A little bit. I also paid $1,500 to sit on my couch sick because I didn’t buy the travel insurance. SHARON: I always wonder if you should buy that travel insurance. ANTHONY: You know, it is worth it sometimes. I still have never purchased it. Ad break: Did you just start a nonprofit like Dan and Anthony? Whether you will have board members, event volunteers, or volunteers headed overseas like Elevate Nepal, you will need volunteer management training. That is why I am so excited that VolunteerPro agreed to sponsor our show. VolunteerPro is offering our listeners $100 off an annual membership. This is a limited time offer. Go to volpro.net and use the promo code PROPOWER. That’s volpro.net, promo code PROPOWER. Now, back to our show. DAN: We’re at the grassroots of it all right now. We’re hoping by next year to pay ourselves a small salary just to keep things going. All our free time and energy and finances have gone into getting this thing rolling. That is not sustainable for forever, but it has gotten us to where we are right now. ANTHONY: Luckily Dan and I have never cared too much about money. You know, we are used to living on a budget. We are used to not having much in terms of financial resources go. This project has definitely cost a lot of money initially both in terms of out of our own pocket and this is another reason why it has taken us five years to get this off of the ground. Luckily the last job I was working I had a pretty good salary and I was able to put a lot of money away and focus on doing this for about a year before we actually launched it so financially I was going to be set for long enough to establish the organization and make a few trips over to Nepal. SHARON: Yea, when we did that road trip I was talking about earlier, we had about $20,000 as our budget for the year, for two people. $20,000, not a lot of money and we actually managed to kind of stay in budget with that. When you live out of your car and you sleep in a tent and you make your food off of a little stove it doesn’t take a lot of money. That was really helpful to me because this year I launched my own company for the first time. There are a lot of people that are afraid to do that because of the financial risk and Jay and I know that it is like, “we can always go back to living out of the tent”. Live on Forest Service land and move every two weeks. DAN: Which sometimes sounds quite nice. SHARON: Exactly. Yea, so, I could go into the rest of it… We own a house now, so we could rent that out and actually sustain ourselves for quite a long time. ANTHONY: You could live in the backyard in your tent. DAN: The renters won’t mind. SHARON: I think that is fundamental. I used to run AmeriCorps programs and knowing how to live off of an AmeriCorps stipend is a really good life skill that you can use many times in your life. DAN: I remember the first time I traveled big like this was that Nepal trip. I didn’t work for a year, which was the main goal. I did volunteer work and what not, but I think I stretched $6,000 out for a year. Like living on an AmeriCorps stipend, it’s amazing how long you can stretch that dollar. It almost becomes a game after a while. I guess those skills have helped us get to where we are now. If we lived a lavish lifestyles, one we probably wouldn’t be thinking about this stuff anyway, but it kind of helps you budget for starting projects; businesses, organizations, what not. DAN: Two months. As we always explain to people, Nepal time is slow time. So if you think something can get done in a day, it is probably going to take five. Two months sounds like a lot, but we were just doing a trip itinerary for ourselves and I don’t know how we are going to cram it all into those two months. It’s great because it kind of brings you back to put things in perspective sometimes, how slow things take. Here in the Western world, especially America, we want things done five minutes ago and that is not going to happen in Nepal, but that is one of the aspects of the country that I love. It slows you down a little bit. SHARON: So what do you think you can reasonably accomplish in two months? DAN: We are going to start construction on homes that were destroyed in the Earthquake. This village is 65 of the 74 homes were destroyed. Every family except one family has left the village. The family that remains there is spanning three generations. They are living under temporary structures, basically tarps and a house made of tin. So we are going to rebuild… they need three homes, we have the financing to build two of those homes. We are really keeping the fingers crossed that the financing for the third will come in. we are going to rebuild up to earthquake standards, using the new codes and give them a safe healthy place to live. Probably put in a new toilet for them, clean drinking water, if the budget allows I would love to put some solar in there, we’ll see. We’ll definitely get two homes built, possibly three. SHARON: What makes it possible for you to do home building when it hasn’t been possible for them during the time since the earthquake? DAN: Just lack of money. The average farmer in Nepal makes less than $300 a year. The new codes that the National Reconstruction Authority, which is overseen by the Nepalese government, these new codes that have been put into place for any new structure built.. a simple home is going to cost upwards of six to seven thousand dollars. So if you make $200-$300 a year, this is difficult. Some villages, some earthquake stricken areas receive aid from the government but it is very minimal. Maybe $1500-$2000 and there is a big monetary gap there with people not earning a large income it is once again almost impossible. So this village we are going to work in, Kali Pokhari, it was right across the river from the epicenter but it is outside the earthquake stricken district. So whatever government funding is provided, this village receives none because they are outside the zone. It would be like living in Yavapai County and Coconino County was the one with the epicenter. So they really have no resources or any hope of rebuilding their homes without a nonprofit or an NGO like us. ANTHONY: And not only this family, but a lot of other families have actually suffered through three monsoon seasons now and they are approaching their third winter. These families do not have adequate housing and it is not uncommon for people to freeze to death in the winter time and also getting exposed to hypothermia because of the altitude. The structures are pieces of scavenged bamboo, scavenged tin, they are very rudimentary and they might even only come up to your waist for how tall they are that these families are actually living in. It is important to help them out and give them some basic human needs back so that they can start improving their quality of life. SHARON: So I have played badminton against you guys, so I know that you are physically capable, but how do you take on such a big challenge? Are you doing this building yourself? DAN: So we are working in conjunction with a foundation in Nepal, which is run by our very good friend Rusham Ball. He’s owned a trekking company in Nepal for twenty years and after the earthquake he started Trek Nepal Foundation to give back to his country. He is our main point of contact over there, which is great because we all have the same mission and vision. How we do it is that we are sourcing everything locally. A lot of nonprofits and NGOS they come into these disaster areas, they start swinging their big bat and “we are going to rebuild this place and look how great we are” and there is a huge disconnect between the local community and this NGO. We are directly involved because we are sourcing everything locally, architects, engineers, general contractors, builders, whether it is skilled or unskilled labor, almost 90% of the material can come from that village or a nearby city. There is road access to all the places we are working so we can get transport in there. Anthony and I… I have building skills and Anthony looks good with a hammer in his hand, so umm, that helps. SHARON: I can vouch for that. DAN: Or maybe just a badminton racket. But we are there mostly to supply financial and emotional support. Our volunteers are helping with clearing rubble, mixing concrete, more the less unskilled labor, the grunt side of it. SHARON: Yes, so you mentioned volunteers. I saw on your website that you were doing a call out for volunteers so do you have other people going with you on this trip? DAN: Yes, this is one of our challenges ahead, but we are excited about it. We have seven volunteers from three different countries coming. Some of these people we do know, some we do not. This is going to be a great test for Anthony and I because we have never done this before. Yea, we are pretty excited to get people involved and I know it will be great for the community. I know they will be well received and welcomed by the people of Nepal. SHARON: I always tell people, because I worked in volunteer management for 10 years, and the part that is fascinating about it is that volunteers are humans and it is basically human management and all the complexity of humanity. Just trying to deal with that. Every aspect of what it is like to be human and build human relationships comes out when you deal with volunteer management. ANTHONY: And to make it a little more difficult you add in the element of going to a place that is totally unlike anything you have seen or dealt with in your life, so yea, there are many challenges ahead, but we are up to it, why not. DAN: Anthony has told me we must be patient. It is a skill I get to work on. SHARON: Count down five days. ANTHONY: Five days till launch. SHARON: Before the guys left the studio I asked them what they thought it meant to be good. DAN: Right, I was living on my parents’ floor, not his at this point. You know, we’re talking about the future and trying to get this thing off the ground and at one point Anthony paused and said, “Basically I don’t know what I want to do with my life other than help people and be a good person.” Even now, what do we want to do with our lives? But I think that is a huge aspect of it, helping somebody and being a good person. It sounds so simple but you tend to lose sight of that and I know we all do and I do, but if you can come back to that of helping someone out that truly needs it, to me that is being good. SHARON: Well, that’s a wrap. Thank you for listening to Do Good, Be Good and thanks to everyone who has subscribed to this podcast. Please subscribe in iTunes to get the next episode when it is released next Wednesday. For show notes on this episode, visit dogoodbegoodshow.com. That is also where you can find the discount code for Volunteer Pro and more information about Do Good, Be Good. I will also include a link to Elevate Nepal’s website so that you can see pictures of Dan and Anthony helping in Nepal. I am so grateful that I got to speak to them before they left and hope to check in once they return to Flagstaff in 2018. Thanks as always to our host Sun Sounds of Arizona for the recording space. Music in this episode is Bathed in Fine Dust by Andy G. Cohen, Released under a Creative Commons Attribution International License and discovered in the Free Music Archive. Until next week, this is Sharon Tewksbury-Bloom signing off.